Carl Johnson explaining his decoy plan to Ran Fa Li and Su Xi Mu. For the mission in Grand Theft Auto IV, see Lure (GTA IV). Lure is a mission in Grand Theft Auto: San Andreas, given to protagonist Carl Johnson by San Fierro Triads leader Wu Zi Mu from his apartment in the Chinatown district of San Fierro, San Andreas. Ran Fa Li has gone to Woozie's apartment in Chinatown, but now the Da Nang Boys are after him and he can't get back home. The Triads are planning a way to lure the Da Nang Boys out. Carl, meanwhile, offers himself to be a decoy to lure the Da Nang Boys so that Farlie can get out of Chinatown safely. Carl gets in a Rancher parked outside the apartment. He drives to the sawmills in Angel Pine. Upon arriving there, he sees a couple of Da Nang Boys. The gangsters chase Carl, thinking the vehicle contains Farlie. Carl traverses through the heavily-forested areas of Flint County and Whetstone. After a long ride, Carl eventually stops at a gas station along the highway. Guppy then calls him, telling him that Woozie has taken Farlie into safety. Later on, the Da Nang Boys eventually realize it's a trap, which results into them getting back to Chinatown. Wu Zi Mu: As honored as I am to share my home with you, we should lure these lizards out into the baking sun! Su Xi Mu: We were followed here. The Da Nang Boys are watching this apartment. As soon as we leave, they will attempt an assassination. Carl Johnson: Hey, what's the big deal? Why don't you cruise on out of here, lead them to a quiet place and cap their flat asses - no offense. Wu Zi Mu: None taken. Su Xi Mu: We find you funny. Carl Johnson: Look, as long as they think Mr. Farlie here is in the back, they'll follow me wherever. After a while, you can come out safely - simple. Wu Zi Mu: Heh-heh. Amazing. 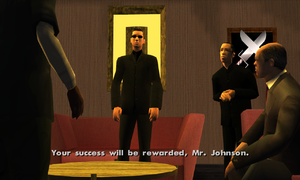 Su Xi Mu: Your success will be rewarded, Mr. Johnson. Guppy: Mr. Johnson, it's Guppy, are you OK? Carl Johnson: Yeah, it's nothing, they took the bait like morons! Mr. Ran Fa Li get out alright? Guppy: Yes, Woozie has taken him to safety, thank you. Carl Johnson: Cool. I'll see you later, man. Da Nang Boy: It's decoy, back to Chinatown! The rewards for this mission are $8,000 and an increase in respect. The mission Amphibious Assault is unlocked. The AK-47 becomes avaliable for purchase at Ammu-Nation for $3500. Inside the game files, there is a Rancher with the internal name of "rncrlure", implying it was intended for this mission. Rncrlure has darkened windows for visual protection, a central element of this mission, but despite this a normal Rancher is used. If you use the cheat to spawn a Rancher it will spawn a Rncrlure. Rncrlure is unmodifiable at garages and doesn't comply for Exports and Imports. If one tries to go and respray the Rancher, it will instead remove its doors, making the player more noticeable. The Rancher can be kept after completing the mission, which will become damage-proof. Carl Johnson luring the Da Nang Boys deep in Whetstone and away from Wu Zi Mu's apartment. The Da Nang Boys realize the plan after Ran Fa Li escapes. This page was last modified on 9 February 2015, at 21:08.